This post originally ran several months ago at the Girls With Pens blog. It’s one of my favorites because I’m always looking for checklists to make sure I’m not missing anything while editing and revising. I hope you find it useful. Whether we plot our stories ahead of time or write by the seat of our pants, we need to ensure our scenes are working as hard as they could be. If we’re plotters, we consciously decide on the focus of our scenes ahead of time. If we’re pantsers, we make up our scenes as we go along, and the conscious evaluation doesn’t happen until revision time. And if we’re somewhere in the middle, we might have an idea of where the scene is supposed to end up, but we take a rambling path to get there, so our revisions will look more like pantsers. However we get there, at some point we’ll be taking a hard look at every scene. Is this scene needed? Is it too long or too short? Does it have tension? Does it avoid information dumps? Etc., etc. Great, but that’s all a little vague. After all, how can we tell if a scene is needed? Sure, some scenes might be obviously unnecessary as we pantsed our way down a rabbit trail, but other scenes feel like they’re needed. So how can we tell? Good scenes should have at least three reasons for existing. Those evil info dump or backstory scenes falter not only because of bad structure, but also because they fail to be relevant to the overall story. They’re missing those other reasons for existing. Janice Hardy has a great blog post about how to mix and match these elements in a way to make the scene feel like a full meal. She points out that some elements, like foreshadowing, world building, or tone should be treated more like appetizers. In other words, those elements shouldn’t be the main point of the scene. Edited to Add: I’ve since created an Elements of a Good Scene checklist and worksheet. I Have Three Elements in This Scene, Am I Good Now? Making sure every scene has three reasons to exist proves the scene needs to be in our story, but we still haven’t checked to make it the best it could be. When we’re consciously evaluating a scene—whether during initial planning or revisions—we need to be aware of the main reason that scene exists. 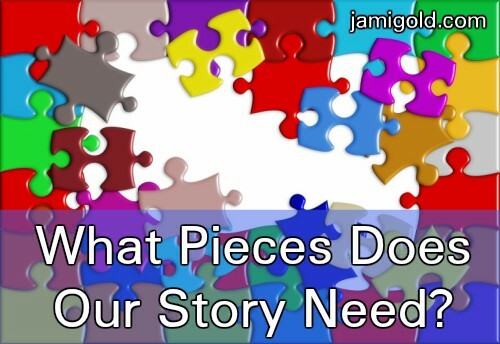 In her post, Janet talks about the elements that are legitimate main points for a scene: Is a character pursuing a goal? Are we revealing important information? Is the plot advancing? Those questions ensure we’re not just padding an info dump scene with two other minor elements. Once we know what we want to accomplish, maybe we’ll decide the words of the dialogue are revealing the right information, but the tone is wrong. Or maybe we’ll decide there’s a better way to show the protagonist’s vulnerability. Or maybe we’ll decide we let the protagonist advance the plot too easily. This takes hard brainpower and conscious focus. I’ll admit this deep evaluation doesn’t come easily to me. But if I take the time to do it, I’ll often see how a sentence here or a reordering of paragraphs there will create stronger emotions in the reader. And that’s what good storytelling is all about. Are you able to evaluate your scenes in depth like this? Does it come easily to you or not? When you’ve evaluated your scenes, what have you discovered? What Advice Do You Ignore? Like you, I pay attention to other senses when I’m editing though. My revision checklist constantly changes as my strengths and weaknesses evolve. 🙂 Thanks for the comment! Another great post and very timely! I am in the process of rewriting a story that I wrote last year during NaNoWriMo. I started the month of November with a handful of characters in mind and a flimsy plot at best. Let’s just say, the story changed a lot from when I started it to when I finished the first draft. This list will really come in handy as I’m trying to decide what scenes stay and which ones go. Thanks! LOL! Yes, that’s how I started my pantsed novel too. I hope this helps. 🙂 Good luck with your revisions and thanks for the comment! Tracked you from Operation Awesome, and am I glad I did! Great post and perfect timing for me, as I’m in the third draft of a YA novel and have to eliminate a huge chunk–probably the entire first half. Your post will help so much! Ouch! You might have to cut the first half of your novel? *hugs* That’s never fun. I hope this helps. Good luck and thanks for the comment! It would be nifty if someone converted the above bullet list into a checklist! It might be the thing I need to make sure my opening scene is stellar and in tip-top shape. Well, the most important thing to do with it right now is to actually get to re-writing it, but I don’t want Chapter One to be weak. And I know what you mean. I have the most trouble with my opening scenes. 🙂 I often have to do heavy rewriting with them. Good luck with yours and thanks for the comment! I’m torn between wanting to fiddle and produce a checklist for this and just leaving it alone until I’m at a point where a scene’s nagging me and I can’t figure out why. Considering how much I have on my plate to get done, I think I’ll do the latter, unless I get some extra time this weekend while I’m out of town, but that’s unlikely. Anyway, I can analyze character goals, but big-picture stuff? Ulgh. The more I’ve made myself focus on the “big picture” stuff, the more I’ve realized that my subconscious mind is far better at it than my conscious mind, so I’ve started backing off and letting my subconscious handle it. As I work with it, I’ll eventually get enough better to get a conscious handle on it, but I’m not there yet. And I’m with you. Most of the time I hope my subconscious and natural plotting/pacing instincts get all the big stuff in line automatically. 🙂 I can do this big picture analysis, but it’s brain twisting stuff for me. LOL! However, when I know I’m having problems with a scene, lists like this are great for trying to figure out why. Thanks for the comment! Yes, I have very limited internet connection this week, so it was time to pull out two posts I knew I wanted to re-run. I’m glad this article has been helpful for people. 🙂 Thanks for the comment! I’m happy to help. Thanks for the comment! This post is relevant in so many ways, but to me, right now, it’s beyond helpful. As I mentioned last post, I recently finished my WIP and I just began edits. I have my critique groups notes, and it’s been months since I’ve read the novel from front to back. basically I’ve let it rest for a while and I’m enjoying the process (and my story, I might add) immensely. Now that I’m into it I’ve found loads of extranious words and I’ve quickly deleted them. I tend to be wordy, so its necessary to trim gobs of fat. But, your list of elements every scene must touch on is an added bonus for me. Something extra I can check to make sure my manuscript is as strong and sellable as it can possibly be. A while back, Susan Bischoff sent me a video of Trey Parker and Matt Stone (creators/writers of South Park) teaching a class on story. In the clip, they broke down a scene very simply: Each one should end with “therefore” or “because of.” If they end with “and then” something’s wrong. When I get to the end of a scene, I give it that test. Now I can add your checklist to my troubleshooting toolbox. Thanks! Ooo, yes, Janice Hardy had a post about that advice just a week or so ago. That’s a great way to make sure everything is a cause and effect rather than just a series of events. Thanks for the comment! Thank you for posting this again! I’ve printed the checklist and can’t wait to use it this weekend. And thanks for the congratulations. It was a wonderful surprise! 🙂 Thanks for the comment! I missed you! I haven’t stopped by in a while. 🙁 You always have such great craft posts. Hope you’re doing well! I think I’ll use this checklist while doing my current revisions. Don’t worry, I understand. 🙂 I have more favorites and must-read blogs than I actually have time for as well. *sigh* Good luck with your revisions and thanks for the comment! Popped over from Bookshelf Muse, and boy am I glad I did. This is the bullet point list of my dreams. I’m off to make an excel doc of it. Thank you, thank you, thank you. I’m glad this post will be helpful to you. Thanks for the comment! Hi Jami, I’m popping in for the first time and so glad I did, there’s a mass of valuable information for me. I’ve taken notes and pondered on my scenes and it’s amazing to think that, mostly (I hope), much of this has come unconsciously to me. I’d never have been able to articulate “what makes a good scene” but now, thank goodness, I can. Many thanks. Welcome! Yes, much of this comes unconsciously to me too. But for those times when we think a scene is needed but it’s not quite working, lists like this can help figure out where the problem lies. 🙂 Thanks for the comment! Great tips, Jami! I’ve learned a lot about analyzing scenes over the past few months. When I’m struggling with the ability to do so, I find taking breaks and coming back with a fresh mind and eyes super helpful. A great list of scene functions. This post will be invaluable in the editing phase. Thank you, Jami. Yes, like many of my posts, this one came about because I wanted the resource too. 🙂 Thanks for the comment! Love this post! I’ve taken a screen shot to download & print. I’m pretty good at making sure I have at least 3 of those elements. In fact, I probably go a little overboard & include too many of those elements. But I want jam-packed excitement & tension all the time & to always be relevant to the story. I know what you mean. I often have about five elements in my scenes, but I guess it depends on where I say one scene ends and the next begins. 🙂 Thanks for the comment!